While Northern Hemisphere readers may be shivering at this time of year, here's a cosy scene of a Yost typewriter basking in bright sunlight. But the Yost is, in fact, heading toward very cold climes: it is sailing toward Antarctica aboard the Endurance, on Ernest Shackleton's ill-fated 1914-16 South Pole expedition. Alan Seaver’s comment about my post on taking typewriters to the South Pole got me digging for more images. 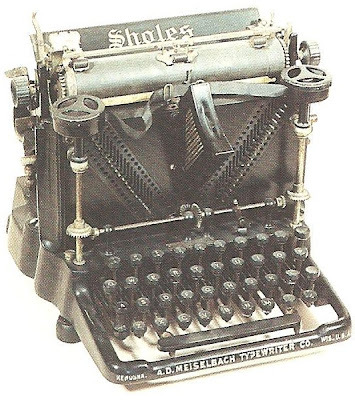 I came up with a couple of beauties – and one typewriter mystery. I had previously looked through collections of Frank Hurley photographs from the Shackleton expedition, without success. But Alan was right, and with his prompting I did find the images he mentioned. 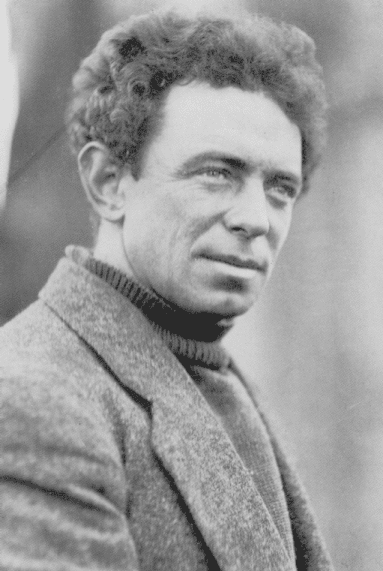 Hurley (born Glebe, Sydney, October 15, 1885; died, aged 76, Sydney, January 16, 1962) took part in a number of expeditions to Antarctica and served as an official photographer with Australian forces during both world wars. 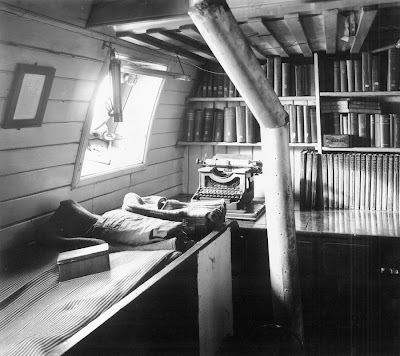 One of the Hurley images shows the Yost in Shackleton’s cabin on the Endurance (which, as Alan suggests, didn’t endure), while the other is of Hurley himself with expedition surgeon Alexander Macklin. Now for the mystery. 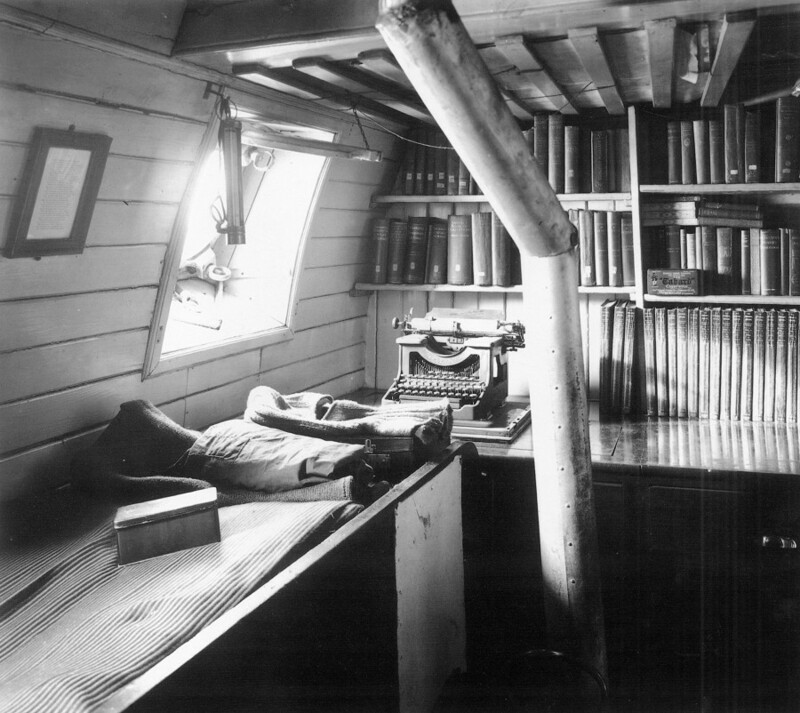 During my search, I came across this image of a typewriter allegedly taken on the same Shackleton expedition. The photograph was taken at a “Antarctica: The Big Ice” exhibition in the Otago Museum in Dunedin, New Zealand, in April 2007. 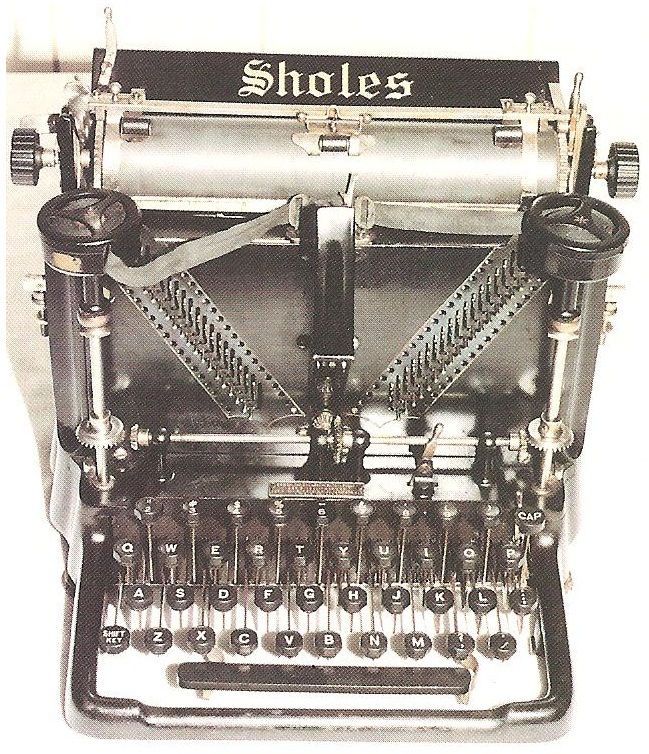 The typewriter is, of course, a fairly rare Sholes Visible. The mystery is the “DES” or “OES” on the paper plate. And how did it survive the expedition? Any suggestions, anyone? This is a very interesting post, indeed. I wonder if that ancient typewriter would have performed decently in the low temperatures and harsh conditions of the Pole, or if the typebars, the platen, and other parts would become brittle and break. Any idea if Captain Robert Falcon Scott brought a typewriter to his ill-fated Antarctic expedition? Hi. Thanks. If you look at the earlier post, "Chilly Fingers", you will see some nice images of the one typewriter taken on the Scott expedition, which was used to produce the "South Polar Times". It is believed to be an Underwood. That's a great post! I prefer the shorter ones, being a german native-speaker. This OES Sholes is intriguing, with the old type for Sholes and a vey modern-looking one for OES. I agree with maschinengeschrieben, that's a very modern looking "OES," reminiscent of the Smith-Corona Marchant "SCM" logo from the '60s and on. 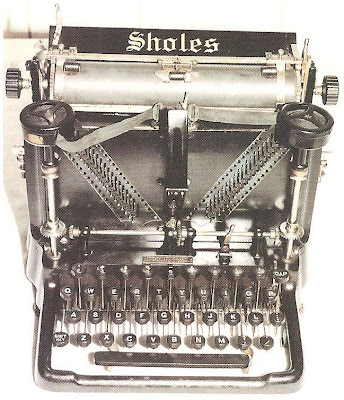 The "Sholes" does not use exactly the same style as other Sholes Visibles I've seen. My theory is that the machine got a new decal from some refurbisher many years after its manufacture. Hi Richard. I have added to the post two images of Sholes Visibles for comparison (should have done that in the first place, I suppose). The decals look very similar. I also believe there was such a thing in that era as the "[British] Overseas Expeditionary Service" [OES]. I found an interesting ad published March 1922. Shackleton had just died in January of that year. 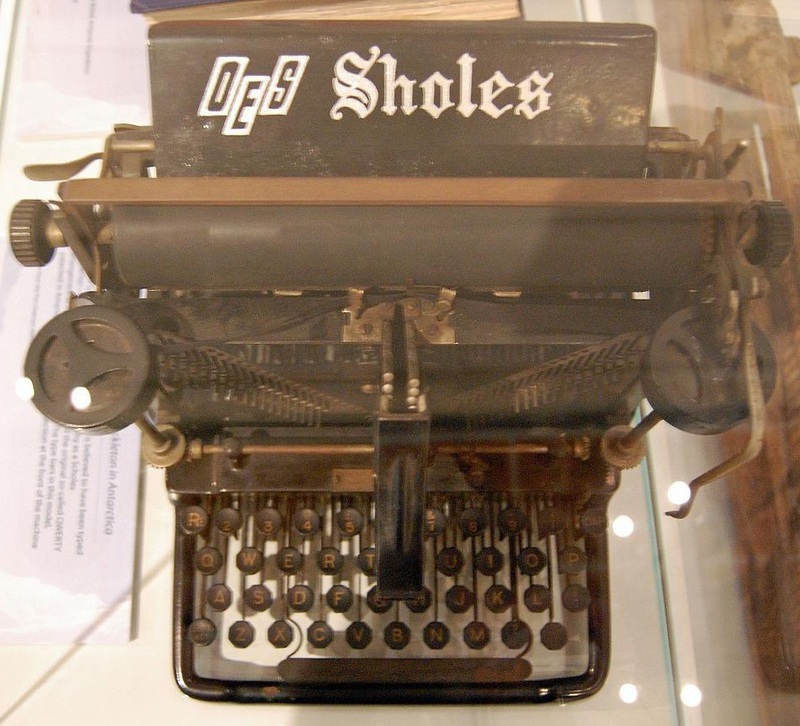 The ad claims that according to Shackleton's testimony, Shackleton's team on Ross island had taken over a Corona typewriter with the serial number 46696 from Captain Mackintosh. After tow years of use, it still gave an immaculate performance. The model is not specified, but it must be a Corona 3. On a 3, this serial number means manufacturing year 1914. Aeneas Mackintosh died in 1916, so this is plausible.